The Google Calculator is NOT related to Firefox 2. It works fine with FF 1.5, and presumably, even with former versions, for it is actually attached to Google search. i can't believe they actually have the answer to the ultimage question of life the universe and everything. google used to know where carmen sandiego was too, (cairo, egypt) but they took that down a while ago...i wonder if they know god's last message to mankind? Am I the only one having problems with this? 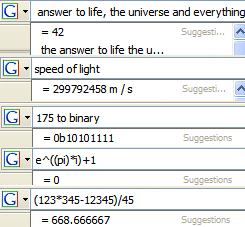 I type in "speed of light" or "the answer to life, the universe and everything" and they both come up with suggestions, however, it doesn't give me the answers... I entered the URL you provided and it didn't do me any good, it just took me to some page or something. Anyway, I don't know what that's all about... Not to get off topic, but "Anonymous," God hasn't given his last messege to mankind, he's still giving messeges. That's my belief. You clearly didn't understand a thing. And I thought a picture can replace a thousand words. You must have Firefox 2 (now in beta) to see suggestions in the search box. Of course you can type "909-67", press enter, go to Google and copy the answer. But this way you just type "909-67" and you have the answer. That URL I gave you is useful if you want to write your own application (or a Google module) that uses Google's suggestions. While Google is certainly more advanced (especially for expressions), if you already use Firefox then there's an extension which performs common conversions much more conveniently: the Converter. Erm, sorry, the URL above is wrong; here's the proper one: Converter. Better and STEP BY STEP calculator (firefox add) - http://www.coount.com/firefox/coount.xpi. Online calculator http://www.coount.com. Very interesting new idea (free online step by step calculator).